The Elgeeco designed Fenn Cage incorporates a full width hinged access door and a restricted access vermin entrance. 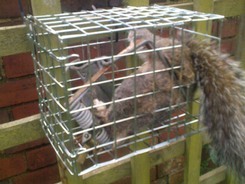 The vermin entrance can be positioned at the side, the top or bottom to accommodate all trapping situations. The elgeeco Fenn trap cage is portable and convenient for use on or off the ground. When covered with a used plastic sack or bin liner, and weighted down if necessary, it provides a secure location for Fenn traps in and around livestock buildings.